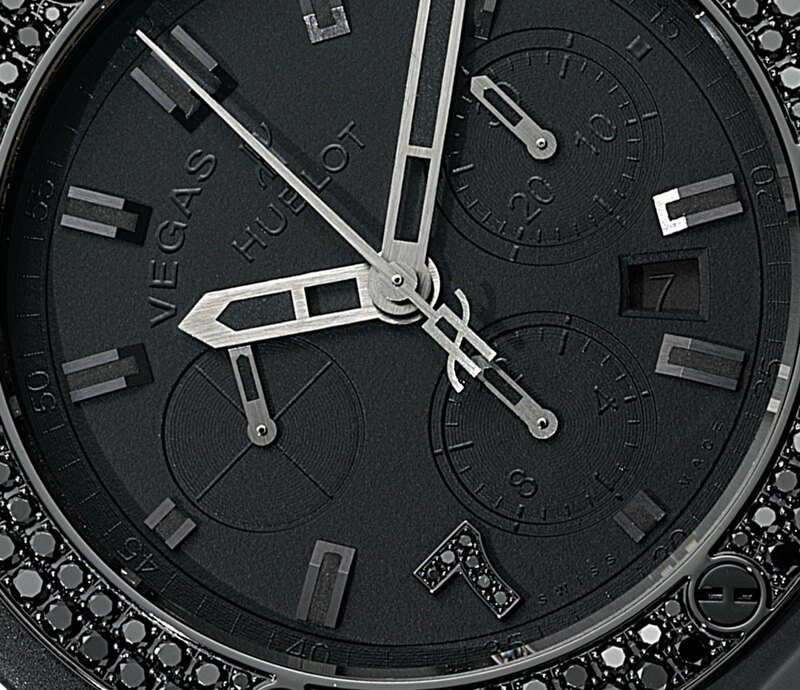 To commemorate the inauguration of their new boutique in Caesar’s Palace Forum Shops in Las Vegas, Hublot launched the Vegas boutique-exclusive Hublot Big Bang Las Vegas Edition timepieces. While there are technically four different references, they are all functionally the same watch offered with different case materials and diamond configurations. At their heart, these watches are the Hublot Big Bang Chronograph powered by the calibre HUB4100, which is an automatic movement that offers 42h of power reserve and beats at 28,800bph. I believe the HUB4100 is either based off the ETA 2894-2 or is a modified version of it. 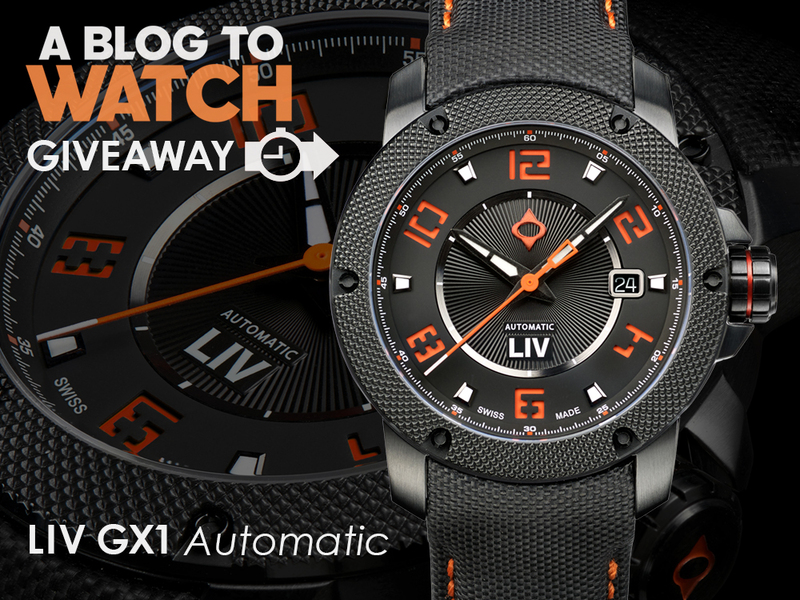 I’m sure, given the Las Vegas connection and Hublot’s polarizing designs in general, you won’t be surprised when I say these watches won’t be to everyone’s tastes. The first two variants start off with a microblasted black ceramic case, while the other two are a combination of ceramic and anodized aluminum and are set with 212 black diamonds. The bezels on each of the watches vary too, with the simplest being a black ceramic similar to the case and the more elaborate ones having anywhere between 48 to 114 diamonds set in them. The most exclusive option – limited to one piece only – comes with the 48 baguette cut diamonds. These watches are ideal for someone who’s looking for some bling (perhaps to signal that they’ve had a successful run at the tables) and isn’t particularly picky about legibility. Perhaps it’s the supplied press images or could just be me, but it seems like legibility wasn’t a key consideration in the design process. The dial is matte black with black applied markers and black luminescent paint, which is known for having a rather faint glow. The 7:00 marker is the only one that is Arabic and once again, set with black diamonds. Even the hands are, and I quote the brand, “satin-finished black plated hands with black luminescent.” The logic of using a black dial with black markers and black plated hands honestly escapes me. The watch images however, make the hands appear to be brushed metal without plating, which should improve legibility in some light conditions. The case of the Hublot Big Bang Las Vegas Special Edition watches are completed by stainless steel pushers and crown (black PVD of course) and a black (surprise) composite resin for the lugs. The case checks in at 44mm wide by 14.6mm thick – well sized for people to notice the bling. It’s also rated to 100m water resistance so you can keep it on while you take a dip at the hotel pool. Yes – they seem to breed like rabbits! going down the only road we’ve ever known…. I want you 2 show me…. I feel we may yet find a way to analogize between these two “extremes” and watch options. Except I don’t know if I’d categorize the “formal” dressy options as fitting better with one kind of music than another; same for “casual” or “sporty” watch options. Well I suppose for a dressy watch I’d look to classical music, actually. For Hublot, I might think of a not-so-great Heavy Metal band (all fury, signifying nothing), whereas for Panerai I’d think of a more accomplished … Heavy Metal band. Still lots of sound and fury, but with some gravitas. Treated Black diamonds are essentially garbage in the jewelry industry. They’re the Asian Catfish of gemstones. Well, Vegas. A lot of show and little substance. Geepers how many Hublews do u review per week? 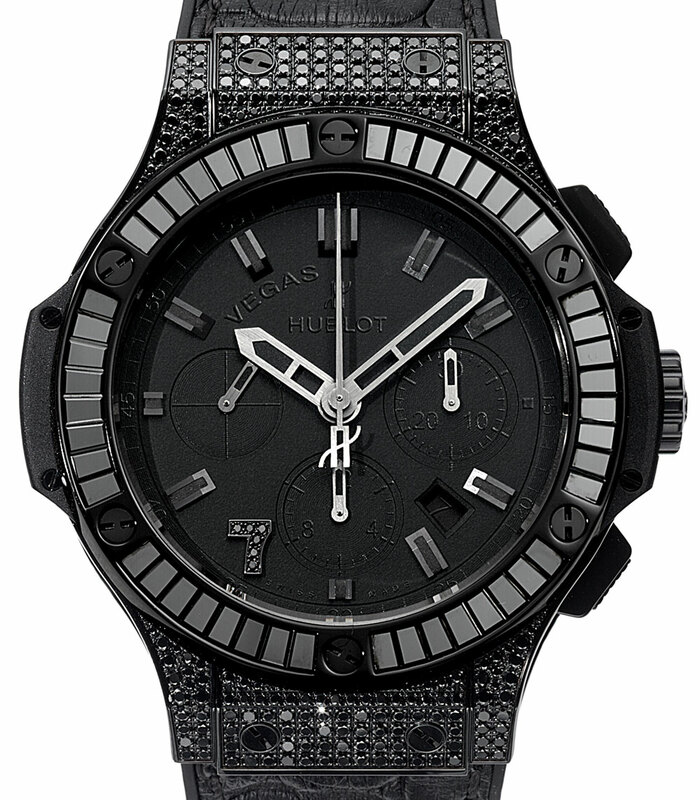 Luke 11:3: Give us each day our daily limited edition Hublot. Judging from the amount of news on them here, looks like Hublot produce half of the watches in the world. Never tire from casing venerable workhorses into something remotedly looking like a watch. I’m sure you can get a big bang in Vegas a lot cheaper than this it would definitely put a bigger smile on your face .? You’re not getting me. 50 people died because of a lot of big bangs in Las Vegas recently. Doesn’t seem like the greatest timing. I recently spent a bit of time in hospital. Being a hawk-eyed watch spotter the only ‘luxury’ watches that I saw. (Always being worn by the highly paid Consultants, Doctors, and Surgeons). Were either Panerai or Hublot. And they were always: 1) chronographs, and 2) very shinny. Maybe it’s part of some psychological or physical test – to see your reaction. If you suppress emesis – you have passed the test. One day someone will have to organize a charity fund for the purchase and destruction of Hublots. If we don’t, then humanity is lost. Drown in tons of this trash. There isn’t as much rappers, Russian gangsters, gypsy and narco barons to digest all this. Hublot breeds faster. Don’t underestimate the number of rappers, Russian gangsters, gypsy and narco barons. 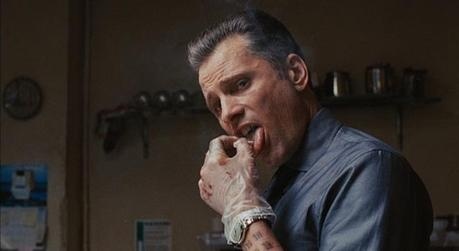 Everything I know about Russian gangsters comes from watching Eastern Promises like twenty times. 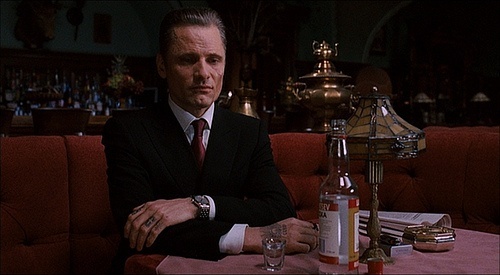 And even Nikolai wore a JLC. 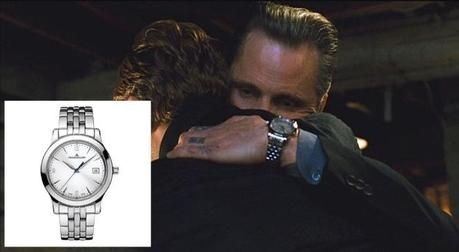 Seems like even the Russian mafia refuses to wear Hublot already. 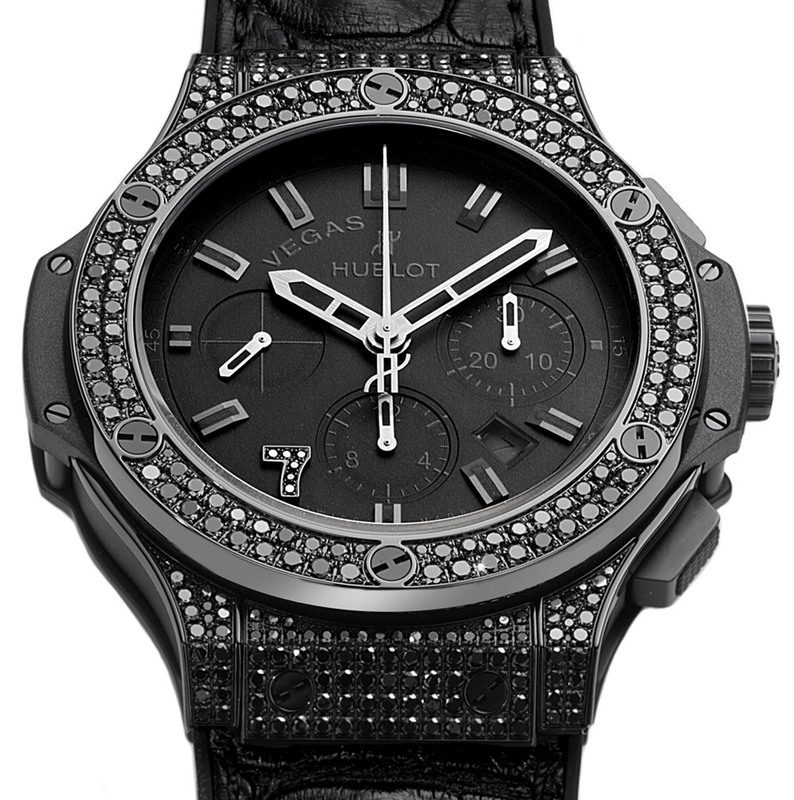 You – “I’m putting 65k on the black Hublot – Let it roll”. Available in the usual gaudy tat-houses that stock our stuff. I’m wondering why ABTW covers Hublot watches with such religious fervour. No matter how many watches Hublot releases on an hourly basis, and no matter how uninspired they are, ABTW is only to happy to oblige. Sure, if Hublot released some truly interesting watches, then I would understand the coverage. 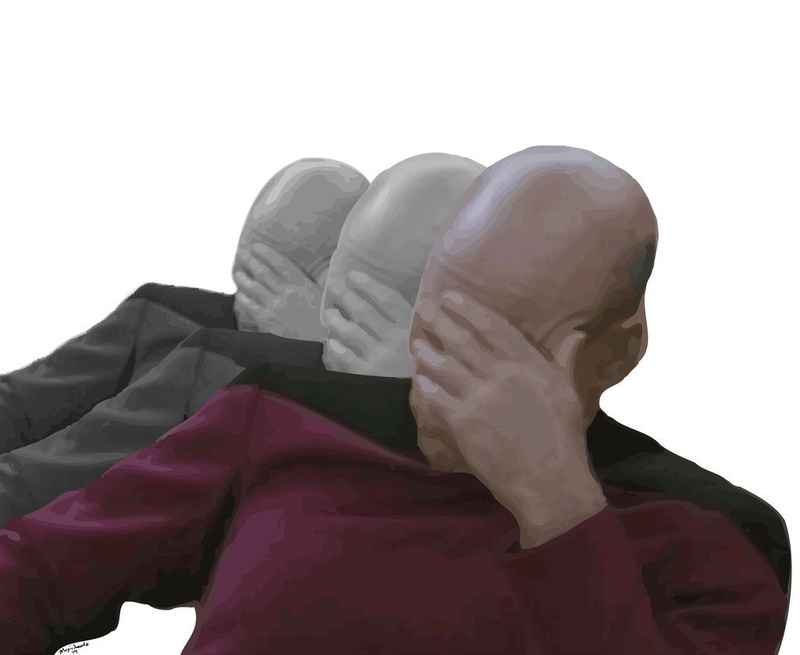 However, Hublot is releasing, re-releasing, and re-re-re-realsing the same watch over and over again, i.e. the same Royal Oak knock off, with the same low-quality fit & finish, and the same low rent “workhorse” ETA. As for the watch, I must admit that it’s by far the laziest & cheapest-looking limited edition that I have ever laid my eyes upon. 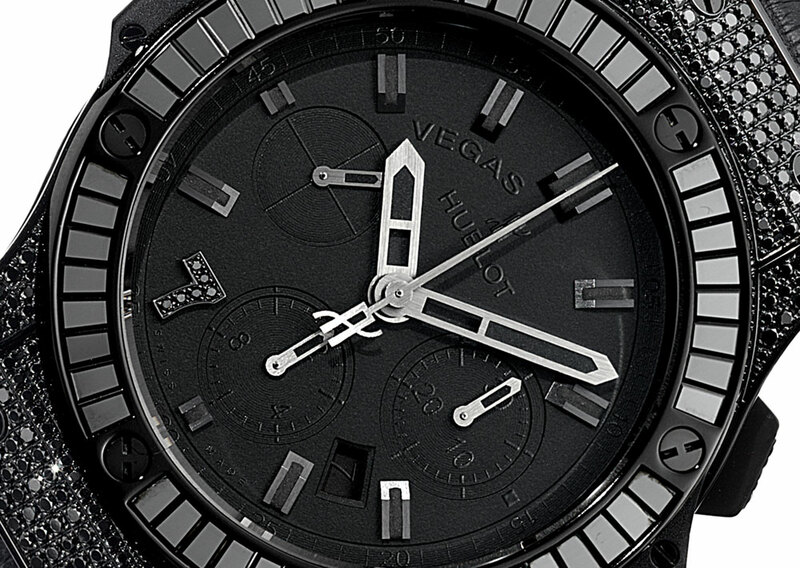 Essentially, Hublot simply added “Vegas” on the dial, and that’s it. I usually criticize the Brewmont Twins, but I have to say that in comparison to Hublot, even the Twins and their bits and pieces of scrap metal appear as super original. Why someone would pay $19,000 — and that’s the starting price! — for a microwawed garbage knock off using an ETA caliber is a real mystery. However, I’m sure that ABTW will soon publish yet another article explaining the genius behind Biver`s black-on-black concept, and the fantastic financial results of Hublot. Lots of reasons why they do. First, A Blog to Watch is all about volume. They’ve got to pump out “story” after “story” and release them on a regular pace spread out during the course of the day. Hublot is better than most any other maker at creating ready-made “stories” for the media. All the pictures are there, all the info is there — all the staffer has to do is switch a few words around, add a few positive ones if they can think of something, and then plop it on the site. Second, if ABTW is slapping up everything Hublot gives them and even sweetening it, the odds of Hublot dropping either some ad revenue or Ariel Adams getting a few free trips or party invites or a tie-in car for the weekend and maybe even a few watches — all go up exponentially. I’ll admit it. If I were ABTW, I would be doing exactly the same thing. But that ETA is a “Work Horse”. its a horse that works. if Apple used it, it would be a Horse that just works. Or a Horse that works differently. If Shinola used it it would be a Chinese Horse that works in America, sometimes. If it was in a Brietling, would it be a super Quartz Horse? I hate when writers use the “Work Horse” which to their credit, they did not in this article. 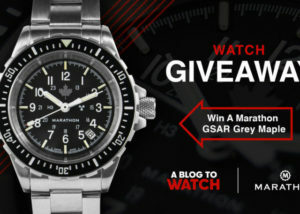 Its a watch movement. its suppose to work constantly for a very long time, as a minimum requirement. it is not however, suppose to cost $19k after you sh!t cheap diamonds on it. I think these things fell out of the back end of that horse! Surprisingly wearable at 44 x 15 mm? Check! Bang bang bang! Well, i guess it is a good fit. 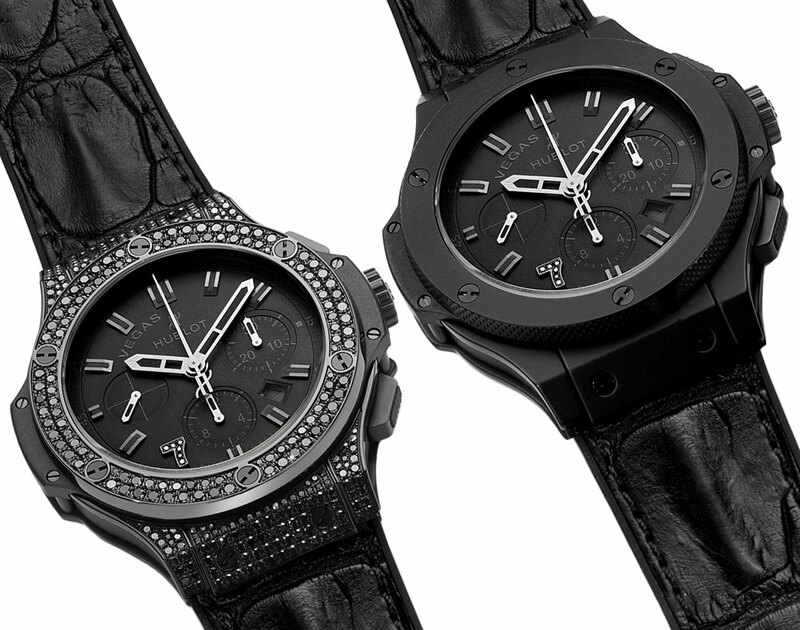 Hublot and Vegas are both gaudy in style and out to take your money. I wouldn’t wear them even at gunpoint. 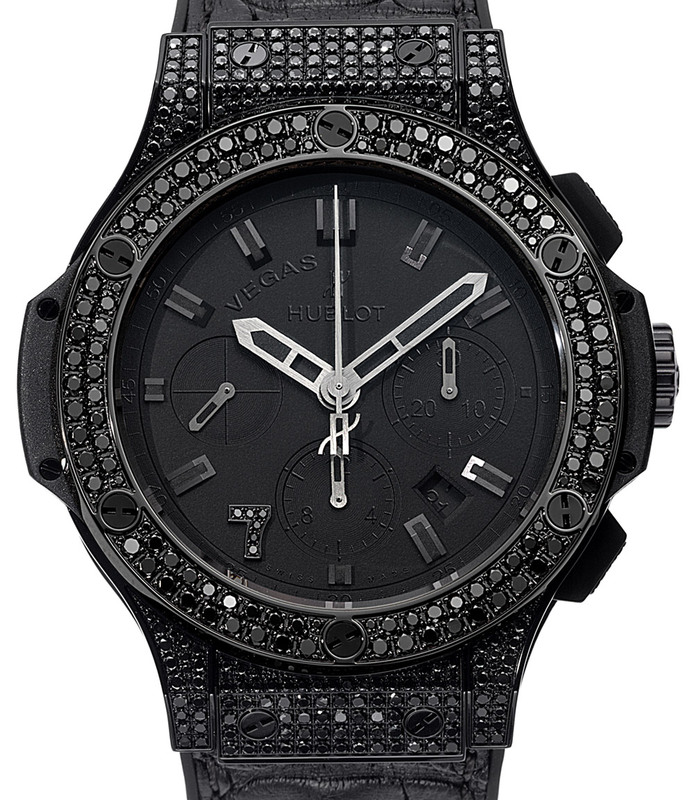 Yes the ublow bingo bango Vegas édition in classy black on black w some encrusted diamonds if u see fit. With such modest starting prices from 18k all the way up to 65k for the Liberace Edition ..
On another note….. the purple jacket guy is back!!! Ahhh yes. The rich people way of telling everyone you have syphilis. These beauties should really stay in Vegas. What happens in Ch. de la Vuarpillière 33 1260 NYON stays in Ch. de la Vuarpillière 33 1260 NYON. Fake, cheesy Paris, fake, cheesy New York, fake, cheesy Egypt, fake cheesy Royal Oak. Is there some sort of internal competition at Hublot to design the most pointless and vulgar watch in history? 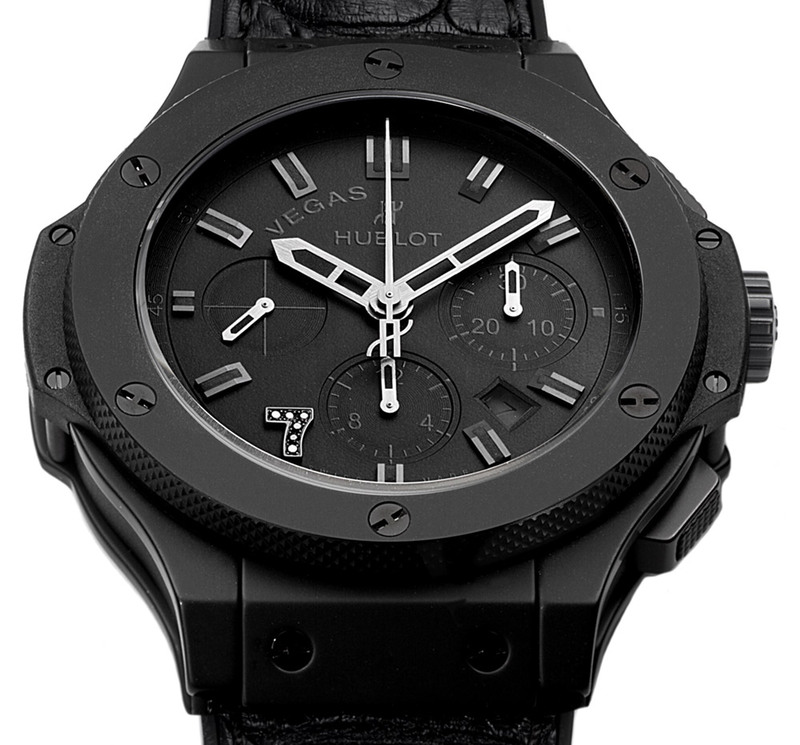 The only Hublot I like is the Big Bang all black.. Looks nice in person..
Every time I see something like this, it makes me hate the world juuuust a little bit more. Why only black and white photos? I’m very happy to see that Hublot finally found a home for their design ethos. Why is the number 7 so significant ? Hmmmm,………….as much as i think how awful is is I’m sure each piece is sold before it was made hense such a limited run. Black on black !, people get paid big bucks for this nonsense. I know i’ll be flogged for saying this, but these look pretty slick – even the one covered in gems. 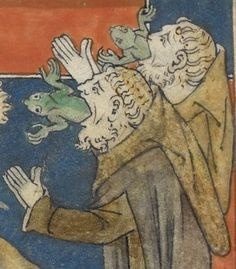 The stones look more like some sort of lizard skin than actual bling. The use of dark tones is good at hiding the mess of the big bang design and really only allows you to see the silhouette, which isn’t so terrible.